Interesting, when we mention acceptance to clients – or the “a” word as some of them call it (!) – two common misconceptions usually rear their heads. One is it sounds a bit passive and wishy washy. New agey. Being like a doormat. The other is that, by implication, accepting something means that we have to like it. 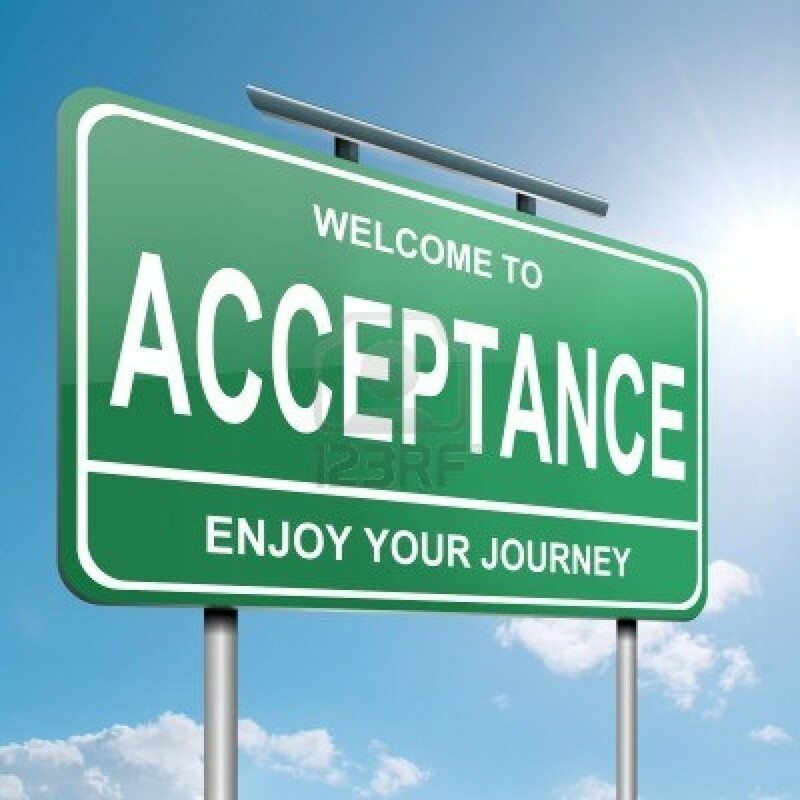 But that isn’t what acceptance is about at all. Quite simply, it’s about going with the flow or life, instead of fighting it every inch of the way. And in doing so, you’re instantly calm and in control of your life again. While we might not like to admit it, much of what in our lives is beyond our control. And that’s regardless of how much we try to plan and organise every aspect of our lives. Whether it’s an unexpected traffic jam on the way to work or the largest world scale events; there really is nothing we could have reasonably done to foresee them, let alone prevent them. And having got into such a negative downward spiral, it’s very hard to escape. Not to mention hard work and, dare we say it, a waste of your precious time and energy. Oh and guaranteed to make you grumpy and miserable, which means you’ll find more things to get caught up in. And so the downward spiral continues. Or, put another way, “whatever you resist, persists” and invites its friends round for a party (!). If this doesn’t sound attractive, how about considering an alternative approach? Of just accepting whatever happens in your life. Not only at this time of year but all the time. Accepting something means that you remain neutral. You don’t feel any particular way about it. You just let it be and don’t resist it. This leaves you free to carry on with your life. And this applies to people just as much as external events. While you may find your boss / colleague / sister / Grandma Flo / fill in the blank the most exasperating person you’ve ever met – and want them to change NOW – the sad truth is that it’s not your job to make them change. How they live their life and behave is up to them. While you can give clear boundaries as to what behaviour you will – or won’t – tolerate, you can’t force them to change. Only they can make this decision, not you. So, instead of getting all het up and stressed about the things you have no control over, why not just take a deep breath and let them be? Decide not to get caught up in it all and remain neutral – accept – whatever happens. Imagine yourself sitting in the audience watching what’s going on, rather than having a starring role in the drama. Or, if that’s too much, removing yourself from it completely. To start with, getting off this daily emotional roller coaster will feel strange and rather disconcerting. And then liberating. Suddenly your life seems to flow so much more smoothly. And, the best bit, as you stop getting caught up in all the trials and tribulations of life, you’ll find that less of them seem to turn up. So going back to the madness of the festive season, why not just take a deep breath and accept whatever happens. And whoever it happens to. Let events unfold and people be. Not only will it reduce your stress levels in an instant, but you’ll have regained control of your life; as you’re no longer at the mercy of what goes on around you.